Over the last couple of weeks I have indulged in many pleasant gastronomic experiences around the city. Below are some pictures of events I attended and the food I enjoyed. And here’s the kicker. 😀 Everything was free! Even technology companies such as Realm, which develops mobile apps, gave away pizza and t-shirts. So I got a free meal that evening, and free clothing. Yay! Whenever I wear my new Realm t-shirt I’m essentially giving them free publicity. The companies try to raise awareness for their brands, sell their services, or recruit people into their community. That’s why they host these events. I can ramble on. But enough teasing. Let me reveal how you can get free food! There are 3 steps that anyone in the developed world can use to acquire free food. Step 1: Live in or near an urban area. Step 2: Sign up with event management organizers. Last week I embarked on a culinary adventure where I would limit myself to eating just $29 worth of food for an entire week. It was not to determine if such a thing is “possible” or not. Humans are very resilient eukaryotes. The average healthy person with a body fat percentage of 20% could survive multiple weeks consuming nothing but water — although it wouldn’t be very fun. 😕 But much like the “no spend days” challenge, I wanted to experience what it’s like to live on a tighter budget like so many poor people do. Here are some simple homemade dishes I put together last week, using the ingredients from my list. The first three days of the challenge were spent eating a little bit of everything from my food basket — although there was a heavy emphasis on fresh vegetables as the tomatoes, cucumbers, and squash had to be taken care of before they start to spoil. I put the bread in the fridge so it would stay fresh longer. During this time I ate mostly sandwiches, salads, and roasted vegetables. These days were more focused on a protein and carbs rich diet — literally the meat and potatoes of my basket. 🙂 I also boiled and seasoned the large white radish. Around day 4 I began to feel weary about eating the same food over and over again. By the end of day 5 I had finished consuming all the fish, crackers, and most of the produce. These last two days were mainly for eating leftovers from my basket. I tried out different ways to cook the remaining turkey and potatoes. At this point I felt peckish for other types of food, mainly something sweet. I realized I should have added some apples or oranges to my food basket. I tend to season lightly when I cook at home. After nearly a week of not eating salty food from restaurants my tastebuds have gotten use to consuming a lower sodium diet. On day 7 I made turkey soup, using leftover meat and produce remains. At the end of the challenge I had some bread and 2 turkey drumsticks remaining out of 14 total. A turkey drumstick is about 13 ounces, compared to a chicken drumstick which is about 4 ounces. I thought about becoming a food taster once, but decided not to because I didn’t want to have too much on my plate. ? Most wage earners get paid either once or twice a month, but we generally have to eat food everyday. This means learning how to budget our grocery bill is an important skill to have. For some people maybe $200 a month for food is enough, but for others it might be $400 or more. Having a personalized budget that is reasonable will teach us about self control, rationing, meal planning, and will probably even save us money. 🙂 If we fail to watch our spending and plan ahead then we may run out of money before our next paycheque and find ourselves in times of scarcity. ? Earlier this week I started a food stamp challenge inspired by a famous celebrity. The idea is to spend no more than $29 on a whole week’s worth of food. I’m about half way through the challenge so I thought I’d give a quick update on how things are going. You can see the previous post for the full list of ingredients and detailed breakdown. So far I’ve gone through most of the vegetables, but I’ve only eaten 5 of the 14 turkey drumsticks. I’ve been making a lot of salads, sandwiches, and roasts. 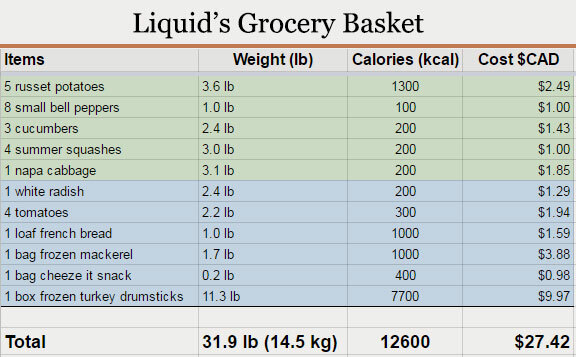 Overall I’m roughly half way through my food basket. Tomorrow I’ll make a quick stew out of some potatoes, radish, and fish. I have 2 squashes remaining which I’ll probably stuff and bake. I have some left-over tomatoes and green peppers which I’m going to use up tonight lest they spoil. Below are some examples of simple dishes I’ve made so far. As mentioned in the previous post I’m only using salt and pepper for seasoning. I first thought this may become boring and repetitive after awhile, but so far the whole foods like tomatoes and bell peppers have quite a lot of natural flavor themselves, especially when cooked, and the salt actually helps to bring out their taste. Since I only eat two meals a day, plus snacks, I don’t have to cook very often. I think eating fewer meals is helping me with this challenge by eating less than other people would. In the United States most people who meet certain low income guidelines are eligible for the Supplemental Nutrition Assistance Program (SNAP, or the food stamp program). Last year glamorous Hollywood actress Gwyneth Paltrow challenged herself to live on just $29 worth of food for one week. According to the Center on Budget and Policy Priorities, $127 is how much the average food stamp benefit receives each month, which works out to roughly $29 per week. Paltrow wrote on her blog, goop.com, that she was doing this challenge to raise awareness for the New York City food bank. She uploaded a photo of everything she purchased for the challenge and set out to not eat anything else for a whole week. This is what her basket looked like from one of her Tweets. Although she did not complete her challenge I have to give her props for trying. 🙂 But of course this is the internet. So when she wrote about her food stamp challenge there was no shortage of criticism and adverse response. As one person aptly observed, “Gwyneth Paltrow bought scallions, onions, a clove of garlic, and fresh parsley. She is doing her poor people shopping wrong.” ? Yikes! Bring out the carving knife because Gwyneth Paltrow got thoroughly roasted, lol. But internet drama aside, this whole situation has inspired me to do the $29/week food stamp challenge as well. 😀 As a personal finance blogger, I want to find out if I have what it takes to live on $29 a week for food.